Welcome to the forum! Where are you located? When you think of YOUR ultimate cobra, How do you define it? You have certainly come to the right place! Welcome and ask your questions. We are a helpful and friendly band of craftsman. If you are looking for someone to help you spend your money, If you are looking for opinions on every conceivable automotive subject, we are full of it!! Enjoy your research, it is the way we all began. Warning: this hobby can be hazardous to your wallet, but it is highly beneficial to your mental health! Welcome to the madness. ...but it is highly beneficial to your mental health! Ain't that the truth? The biggest reason my wife got motivated to support this project was seeing how depressed I get when I don't have anything to work on or tinker with. Entire weeks would slide by with me just ANGRY at everyone and everything. Not raging, yelling, throwing stuff mad, but a real simmer. Life is grand, these days! Building a Factory Five will change your life in so many ways that today you can't even begin to believe how much. 1. Watch the Factory Five assembly videos because while a picture is worth a thousand words, these videos are worth so much more. 2. The next thing you should do is check out the build threads of Edwardb's two MK-4's because they will really give you great insight showing you how to build the perfect MK-4. 3. Once you've done these two steps order a copy of the manual and read it a few times, then read it once more just for fun prior to ordering your car. 4. Consider also going to the Factory Five Build School if you have some time to spare. Good Luck, Welcome To The Forum & We Hope You Are Able To Join Us On This Incredible Experience! Last edited by GoDadGo; 09-14-2018 at 06:36 AM. Before I got my kit, I had only moderate car maintenance experience. So far, there's been no assembly tasks that are beyond my ability. I did take my 3-link axle to a welder to have the banana bracket attached, but that's really it. Any shortfall you may have in your experience can very quickly be backfilled by the experts on this forum. I'm constantly amazed by the patience, experience, and cheerful support available here. When you thin of YOUR ultimate cobra, How do you define it? I am in Aiken, SC. Well, I think of that blue Shelby Cobra with twin white racing stripes that I had a poster of when I was a kid. Those beautiful bulbous lines. I would love a Coyote motor with a manual trans. I have a buddy that can get me a motor and trans out of a newer model Mustang. Just need to make sure it will work and make sure I build the kit that I need. At the moment I do not care about lots of bells and whistles. I just want something that will perform well and looks and sounds amazing. A car that I can drive on the weekends and to some local car events, and maybe take it to the mountains. I would love to take it to the track, but I know the costs involved with racing and putting a vehicle on the track. I am not ready for that yet. My son is 15 and this would be a great project for us before he heads to college. Welcome the THE forum. I had very little automotive mechanical experience when I started my build a little over a year ago. Without question, every single thing that I've needed help with has been answered by my fellow builders on this forum. The FFR community extends well beyond the virtual space and I've met several other builders in my area. They've helped me when I've needed a few extra hands and I've returned the favor. I've sent parts to other builders and have had the same when I've needed some obscure item. I even met a husband and wife team from Indiana who were enjoying the scenery of the Colorado Rocky Mountain roads. As others have said, define what your vision is for your car and build that. We'll try to convince you to go with every modification we've done to our cars, but in the end, you will get the same eager help regardless of what you choose to build. I want to use a Coyote motor and trans out of a late model Mustang. Is there somewhere I can go that has a list of everything I would need to transplant it into a MK-4? I think the Coyote option that FFR is showing is a crate motor. A couple questions on shipping and delivery. I live in Aiken, SC and my driveway is a little steep at the entry. First, I see the FFR semi delivering the cars in all of the builds. Is that normal? What is the general cost? Also, how easy is it to push a kit up a hill or should I plan on a trailer or flat bed to move it to my shop? I think you will find there are two main groups among builders when it comes to delivery. The first are those that go pick up their kits themselves, and the second are those that use Stewart Transportation for delivery. I think there may be a small number that have gone a different way, but can't speak to what those options may be. I used Stewart to deliver my kit. They have a really efficient setup with a crane hoist system in their trucks to easily unload the car. The chassis with the aluminum and body weigh in at less than 1000 pounds, and can easily be moved with a dolly. Stewart's dollies have large tires like a piano dolly and can move easily across rough surfaces like gravel. Two people can move these things up a hill that isn't too steep. How step a hill are you talking about? How long is your driveway? A come-along and some rope and pullies might help if it's a steep grade. To get an accurate cost for Stewart delivery, just give them a call and they will quote you a price. Last edited by Papa; 09-22-2018 at 10:15 AM. I think you will find there are two main groups among builders when it comes to delivery. The first are those that go pick up their kits themselves, and the second are those that use Stewart Transportation for delivery. I think there may be a small number that have gone a different way, but can't speak to what those options may be. I used Stewart to deliver my kit. They have a really efficient setup with a crane hoist system in their trucks to easily unload the car. The chassis with the aluminum and body weigh in at less than 1000 pounds, and can easily be moved with a dolly. Stewart's dollies have large tires like a piano dolly and can move easily across rough surfaces like gravel. Two people can move these things up a hill that isn't too steep. How step a hill are you talking about? How long is your driveway? A come-along and some rope and pullies might help if it's a steep grade. To get an accurate cost for Stewart delivery, just jive them a call and they will quote you a price. Is Stewart the company that has Factory Five on the trailer? Those are the ones I am speaking of. The grade at the front of the driveway is about 30 Deg. I will need to go through about 100 feet of grass to my shop as well. Are there any pictures of the dolly they have? A come along or a winch would be a good idea. Stewart is a great option because that crane/hoist eliminates the need for a shipping crate (which costs extra). My driver didn't have a dolly, so I had to build one and have it ready. Lowered the frame onto it, and pushed it up my driveway, easy as pie. Felt like pushing one of my kids on a skateboard. My driveway is probably closer to 10*-15*. He estimated my 818 and body panels at 500 pounds. My wife was able to help me flip the frame up off the dolly later so I could drill holes for the bottom aluminum. Built my dolly for practically nothing with some lumber from the "irregular" pile at home depot (80% off retail) and some donated wheels from a friend (thanks AZPete). I'll second just calling Stewart. Email works, too. They deliver so many of these that they'll be able to tell you pretty much off-hand. I am now wishing I had not sold my 7x16 enclosed trailer. I am now thinking about making the drive with a Uhaul trailer. I sent a request to Stewart for an estimate. I will wait to see what they say. 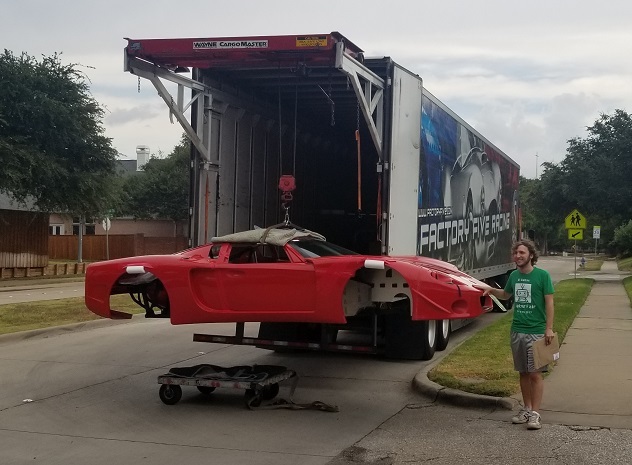 Below I will post a picture of a GTM being delivered and the dolly they used. I got my Hot Rod delivered in two stages and they had the dolly in both stages. Grass no problem... Even a steep drive way is not a problem because the cars are so light. Ryan, the guy in the picture with his GTM, and I pushed his GTM about a block up his alley and into his garage with no problems. He then came to my house and helped me get my Hot Rod body in. We carried it up the alley about half a block and then up my driveway. The frame and body are fairly light and all the other parts are in boxes. I don't think you will have a problem. That is great. Thanks for the photo. By the way, Stewart quoted me $1300 delivered to Aiken, SC. They said the driver should be able to deliver it into my shop. Considering the cost, I wonder how much it would cost me to go pick it up. I would probably need to rent or borrow a trailer. I hate borrowing stuff so I will probably rent or even buy a trailer.